Got a little ambitious tonight and recorded some clips of the VOX Time Machine this evening. All clips were recorded with my trusty Aracom VRX22 amp. The first is a short song featuring my CV Tele in the rhythm and my Gibson Nighthawk 2009 doing the lead. This was close-miked to a 1 X 12. With the next four clips, I wanted to a chorus kind of vibe going by hooking up two 1 X 12’s to my Aracom PRX150-Pro’s speaker outs. I didn’t record in stereo. I just used my Sennheiser e609 placed about a foot away from both speakers that were about 75 degrees turned toward each other. Sorry for the background noise that’s the ambient noise in my garage – I had to turn up the input gain a lot to get a decent recording signal. The first clip is just a simple chord progression done finger style. 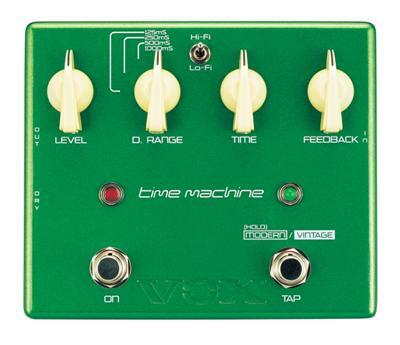 The pedal is set to about 11am level and 2pm feedback. I tapped in about a 72 bpm tempo. The next clip has the both level and feedback at about 2pm with a 60 bpm tempo. This is sort of a “space echo” type of thing ala Steve Miller. With this next clip I wanted sort of a heavy slap-back type of vibe doing a rhythm part on the 5th and 6th strings. At the end I play an Em chord very lightly to demonstrate how the pedal reacts to pick attack. The Time Machine is set to about noon on the level and 11 am on the feedback. I’ve got about a 90 bpm tempo. Finally, I did another short song to demonstrate how the Time Machine works well to get a gorgeous, spacious tone for clean leads. Here I set the level at 10am and feedback at 2pm, and also engaged the vintage mode, which produces a bit thicker of a tone. The rhythm was just recorded with a reverb. Thanks, Cody! I really dig the sounds the Time Machine can produce!